» Junk Hype- What’s in a rating? 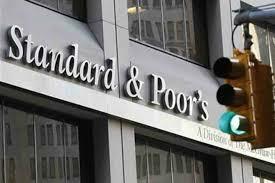 On 3 April 2017, S&P Global Ratings downgraded South Africa’s sovereign credit rating from BBB- to BB+ i.e. sub-investment/speculative grade or our new favourite catch phrase “junk”. Panic and pandemonium was the order of the day given that the decision was made shortly after President Jacob Zuma announced a cabinet reshuffle that resulted in the dismissal of former Finance Minister Pravin Gordhan. Yuval Noah Harari “Inter-subjectivity”, the theory that the collective belief in a concept by large groups of people is the only thing that gives credence to its perceived existence. In other words, it only exists in our collective imagination. Credit ratings are an inter-subjective concept. I raise this as there was a growing number of people on social media opining particularly on the fact that the rating should not matter and who are these agencies are anyway? 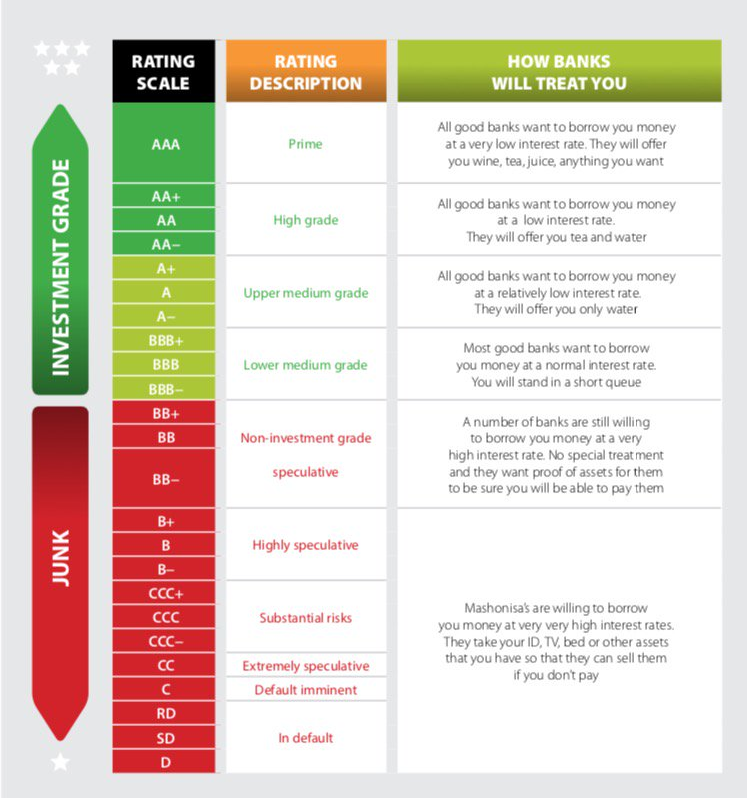 Unfortunately the investor universe believes in the inter-subjective idea of a credit rating; it gives them comfort when deploying their funds, it provides issuers with opportunities to tap markets on a “fair” basis such that those with weaker credits should compensate investors for the higher risk they take. It is fundamental to the financial system and the theory markets are predicated on. Much can be said on the credibility of the agencies themselves, having played a significant role in the 2008 financial crisis however until we collectively decide that ratings should play no role in investment/lending/borrowing decisions. So here we are, speculative grade, what are the implications? Government bond yields increase, making SA Incorporated (Inc) obligations more expensive. It must be noted however that due to low and in some cases negative bond yields in developed markets, this has actually increased foreign investment in local bonds because investors will now be paid more. The concern is to what extent can SA Inc continue servicing debt at these new levels? My opinion, all things being equal, a considerable amount of time until the risk breaches thresholds. Interest rates increase. The South African Reserve Bank (SARB) will likely start to increase rates towards the end of the year should inflation not behave thus depreciating the Rand (ZAR). This increases the cost of living for us ordinary citizens. Exports increase. Our current account deficit should theoretically reduce as exports become cheaper for our offshore trade partners. Imports naturally will become more expensive due to the deteriorating ZAR. Diminished economic growth. The effects of the above will most certainly weaken gross domestic product (GDP) as interest rates increase and consumers stop spending and investors retreat. This is undoubtedly a dire situation. S&P downgraded our foreign currency rating while our local currency rating remains investment grade. This means that our ZAR denominated bonds are still investment grade and good credit quality. At the time of writing, Fitch confirmed a downgrade of both our local and foreign currency rating to sub-investment grade with a stable outlook. Should S&P downgrade our local currency too, South Africa will be removed from a number of emerging market indices. It may take the country on average 5-7 years to return to investment grade, this is the new normal. So what can you do to survive these uncertain times? SAVE, I cannot emphasise this enough…that rainy day is closer than you think, control your spending. DO NOT TAKE ON UNECCESARY DEBT, buying a new property is probably not the smartest thing to do if you are relying on a mortgage. Interest rates will only go one direction and that’s up in the medium to long term. STAY POSITIVE, the only way we can get through this is to do the best we can do and remain resolute in the goodness, strength and perseverance of our society. We are survivors. 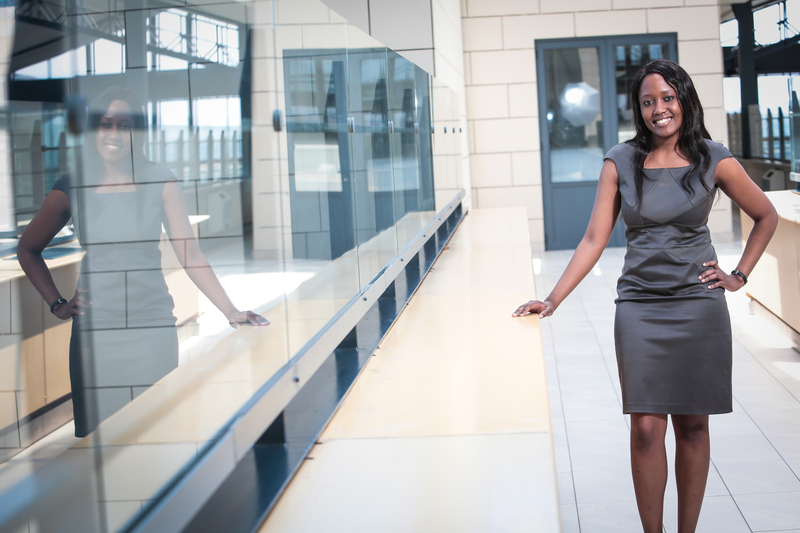 Nswana is an investment banker working in debt capital markets. She is a founding member of Mbewu Movement and her passions include women empowerment, travelling, fashion and music. Love your writing style. Indy.